Sharks in Lake Tahoe? Card Sharks maybe, although you may see other aquatic species in the crystalline clear waters of Lake Tahoe. 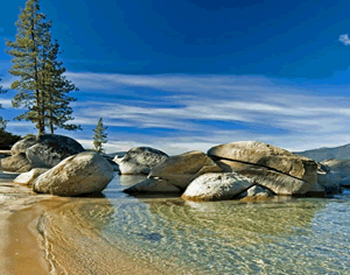 Sand Harbor State Park located on the northeast shore of the lake offers both comfortable water and air temperatures this time of year, making it a perfect swim venue. The 1-mile swim will start at the beach next to the boat ramp, swim out through the unique rock formations and finish at the south end of the park’s Main Beach. This swim is particularly special, as it takes place at the most stunningly beautiful, boulder-strewn area of Lake Tahoe. The event is limited to 400 participants, so don’t wait to register! Note: This event formerly took place at Incline Village and Burnt Cedar Beaches. PARKING: Parking is available in Sand Harbor State Park for $10 per vehicle. You will be directed to park near the swim finish and there will be a short walk from there to the check-in area and swim start. CANCELLATIONS: Registrations are non-refundable. If you can no longer participate in this event, you may receive a rollover credit (minus a $20 processing fee) toward a future event as long as you let us know by July 30 2015. After that date, a doctor's note is required to receive a credit.